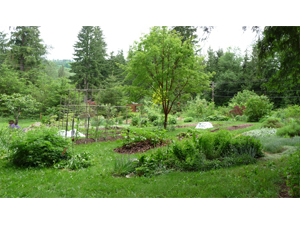 The Garden at Winterhaven was located on 2 acres five and half miles south of Monroe, WA. Sara Schurr and Walter Cooke cared for the land here from 1987 to 2014. Sara tended the vegetable and flower gardens and pruned the fruit trees. Walter mowed the lawn, made compost, chipped debris and tended the woods. Winterhaven changed a lot through the seasons. These photos start in spring and take you through an entire year. The garden design was created in consultation with the devas and nature spirits who live on the property. Our goal was to create a landscape that was in balance with the energies of the location and to encourage as much diversity and harmony as possible on the site. The resulting landscape supports a wide array of birds and wildlife. We use organic gardening practices as much as possible, though occasionally we encounter a problem that requires something a little stronger--we use ant stakes when ants invade the house or the hot tub! The garden is more about healthy exuberance and natural balance than it is about order or perfection. Copyright Winterhaven Press 2008 All rights reserved.